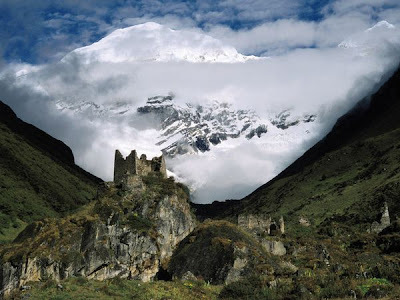 As our new BCF Class of 2014 flies into Paro to begin their new year in Bhutan, we thought we’d showcase a beautiful trek that past BCF teachers have made – maybe our new teachers will get the chance to visit as well! Chele-la Pass lies between the Haa Valley and Paro Valley and is the highest pass crossed by a Bhutanese highway through dense spruce and larch forests. It’s at this pass that you can see the spectacular views of the mountains Jhomolhari and Jichu Drakye and be surrounded by prayer flags. A cow decides to take a break and parks itself between two cars in this week’s Photo of the Week! I can’t back out because there’s a cow in my way! BCF teacher Brick Root has captured this amusing moment and says that it is quite normal to see in Bhutan! 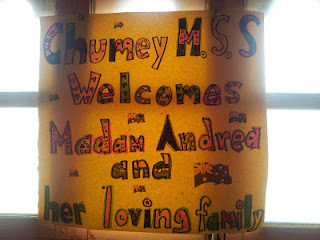 This week’s photo comes from Andrea’s blog! Andrea thought it would be a great—not to mention fun!—learning experience for her students if she incorporated some arts and crafts into her teachings! Andrea teaches them new English vocabularies through ‘her how-to-make’ instructions all the while building up their confidence in their art skills! Check out some more creative art works at Andrea’s blog! 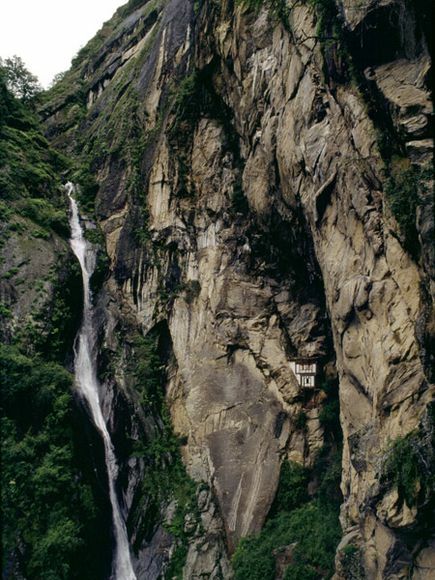 This week, we feature one of the most exquisite views Bhutan has to offer – the Tiger’s Nest, also referred to as Paro Taktsang Monastery. Located on a granite cliff, 600m above Paro Valley, in the Paro Dzongkhag, this monastery is known for the peaceful silence it offers its visitors, who climb 2 hours to reach it! The magnificent view from the monastery is well worth the climb, as the best vistas are from the gardens of Sangtopelri. The interior of the monastery is also a colourful sight to see. The best time to visit is in the Spring months of April and May when flowers are blooming and the Paro festival takes place. Applications to teach in Bhutan in 2013 are now open! This week’s photo of the week comes from Arwen’s blog, Arwen in Gasa. 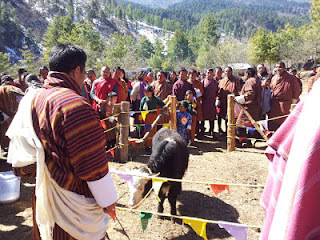 Arwen recently got to partake in the five-day holiday, the Gasa Tsechu, which is an annual religious Bhutanese festival held in each dzongkhag on the tenth day of a month of the lunar Tibetan calendar. Tsechus are large social gatherings that perform the function of social bonding among people of the remote and spread out villages in each district. The focal point is the Cham dances, as seen in Arwen’s fantastic pictures. 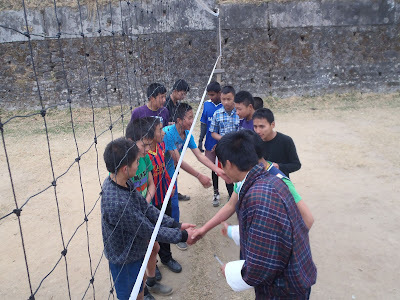 This week’s photo of the week comes from Andrea Chisholm’s recent blog post February Photo-A-Day in which Andrea and her family took and uploaded a photo for each day of February representing their unique experiences and capturing great memories while teaching in Bhutan! Check out her blog, From Down Under to the Top of the World, and choose your favourite from the many photo days of February. 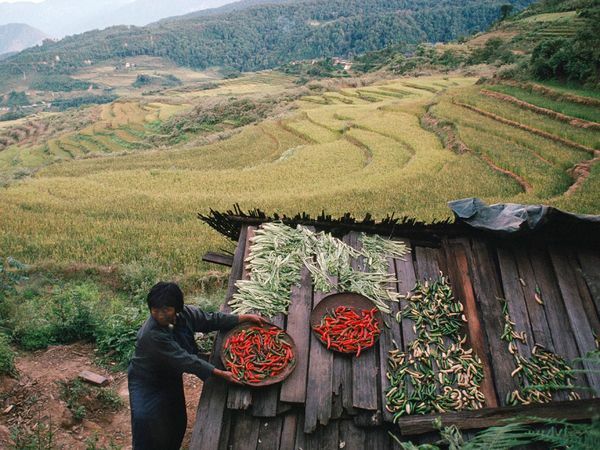 We’d love to see your photos of Bhutan! This week’s photo of the week comes from Heather Robertson, one of our teachers in the field! The photo, along with many more on her blog, show students at Chukha HSS playing a recreational game of volleyball as implemented in their curriculum. Class-wide volleyball is a great way to step outside of the classroom and stress the importance of their health and well-being. Click here to check out more fun pictures on Heather’s blog, Heather Robertson in Bhutan. 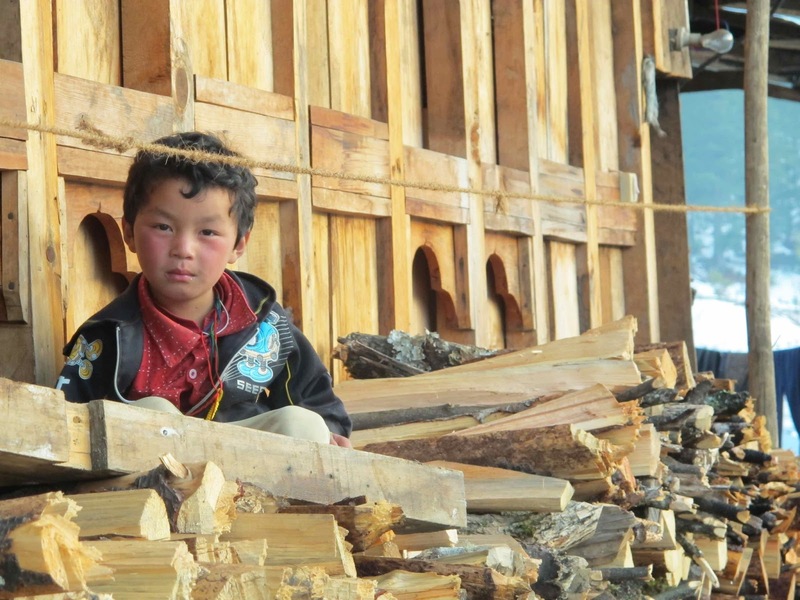 This week’s photo of the week comes from Matt Stretton from the capital, Thimphu, and his new house in the village of Chamgang. His photos contain pictures of the village, including this photo of the week of his neighbour hanging outside in a log pile, as most of the houses in the village are heated by Bukhari (wood stoves). To read more about Matt’s adventures in Bhutan, check out his blog: Bos Grunniens: Adventures in the Land of the Yak. After four weeks of travelling in Bhutan, Cameron Brown has taken some remarkable photos of his surroundings in the Kingdom of Bhutan. Describing Bhutan as a “peaceful country”, Cameron has managed to capture the essence of Bhutan in his pictures, in which many more appear on his blog. To check out more pictures and read through his posts and descriptions, please visit Butter Tea at Sunrise. Bhutanese Landscape and School children posing. Bhutanese girls posing for the camera. The week’s stunning collection of photographs comes from National Geographic Travel‘s section on Bhutan (“Bhutan: Kingdom in the Clouds,” May 1991, National Geographic magazine), photographed by James L. Stanfield. Copyright 2019 Bhutan Canada Foundation. All rights reserved. Powered by WordPress. Theme: Suffice by ThemeGrill.